This week was orientation for the newest class of future grad's from The Fashion Institutes's Los Angeles Campus. Being an Alumni I was invited to speak to a few hundred people (no pressure, right!) My speech went off without a hitch and the audience seemly approved of my advice and giggled at my stories of trials an tribulations as a student myself (ha ha...little do they know). While waiting, I was excited to see each of the students receive their first official "FIDM" branded SWAG gift. I have to say for a second it took me back to my first day of school. This would be "THE BOOK" that would organize my life for the next year. 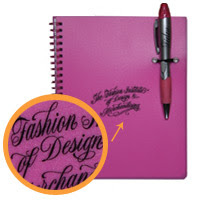 With this single notebook FIDM instructors would teach me to organize my life by using a dated notebook, and become the organization freakazoid I am today! Though a lot has changed in the 10 years since I roamed the halls of FIDM the notebook is still a staple. It has had a face lift (see image), but the inside still holds the same value. I dedicate this post to the FIDM Notebook...."Thank you FIDM notebook!" 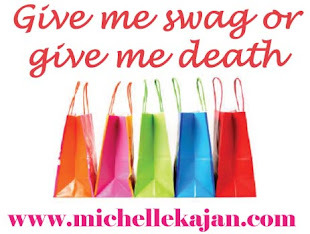 Independent Film Channel and Star Magazine are currently holding a SWAG bag promotion. 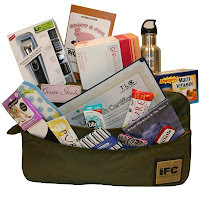 Enter to win at Star Magazine.com ASAP as the bag is full of an array of fab products not to mention the branded IFC keepsake bag! If you want to create a SWAG promotion like the IFC/Star Mag. promo contact me as I can help you source a branded bag like the one in the image.